When Methodist Hospital needs hot water to sterilize its surgical equipment, or when Lucas Oil Stadium needs to keep 63,000 Colts fans comfortable, they depend on the versatile and cost-effective energy services of Citizens Energy Group's thermal service. 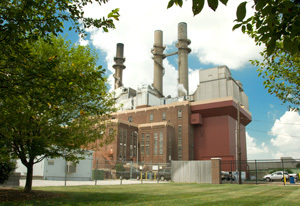 Across the growing downtown Indianapolis area, more than 250 commercial buildings and industries depend on steam for heat and more than 60 utilize chilled water for cooling from Citizens. Citizens Thermal can also manage onsite energy facilities for commercial and industrial customers. Citizens can manage a variety of existing onsite utility facilities including heating, cooling and electrical systems. This service can free industries from both maintenance and operation of facilities. Citizens also will design and then manage onsite energy facilities. Cost-effective - Besides providing cost-effective energy for commercial buildings and industries, Citizens eliminates capital investments for expensive boilers, chillers and other energy equipment. Free up valuable space - Without large energy equipment needs, you have more space to devote to your particular business. Focus on your mission - Not having to manage and maintain energy systems permits you to focus on your particular business, rather than providing your own energy services. Reliability - Citizens Thermal operates year-round and service interruptions are very rare. Efficiency - District cooling reduces peak electric power demand in the summer, helping your business avoid expensive peak demand charges typical with conventional cooling systems. Environmentally friendly - Not having your own energy facilities reduces the time and expense required to comply with increasingly sophisticated environmental regulations. Stable rates - Although national energy costs often fluctuate, Citizens keeps its rates relatively stable by using a mix of fuels including coal, coke oven gas, natural gas and fuel oil. Positioned for Growth - Citizens' sound business and financial plan is allowing it to continually expand its systems to meet the growing energy needs of the city.